You have accomplished the most amazing challenge you have ever undertaken in your life – you have been accepted to college! All your efforts have been rewarded with those magic words, “we are pleased to inform you of your acceptance”. Congratulations! So what do you do now? Or maybe the question is, what DON’T you do? Think of your entire high school career as an audition for college. You can’t give up before the final curtain. Keep those grades up and GPA in good shape. You may be a second semester senior but don’t lose your focus. You’re still a student! It can be very tempting to sit back and relax and not expend too much energy on anything. But don’t be fooled into thinking that once you’ve been accepted, you’re in no matter what. Your entire senior year is important. Once you complete your senior year and receive your diploma, college are still going to look at your grades – including the ones from your senior spring semester. If your GPA drops significantly it can tell colleges that you don’t care about academics. And they can rescind your acceptance. That’s right–you essentially get “un”accepted! Many scholarship and grant opportunities–as well as other forms of financial aid–often have requirements that include a certain minimum GPA level. The higher your GPA is, the more scholarships and grants you could qualify for. Set short-term and long-term goals for yourself. Having clear goals is the simplest way to stay motivated. Write down your goals for this semester, and be specific about how you’re going to achieve them. For example: What grades do you want in each of your classes? Do you need a specific GPA to maintain a scholarship or financial aid? What skills do you want to improve on before heading off to college? Focus on earning college credit. If you’re taking Advanced Placement or other college-level classes, you may need a certain grade or test score to get college credit. Doing well in these classes can help you place into more advanced courses, graduate early, and spend less on tuition—all very good things. Studying hard now can make a big impact on your college career. A lot of time is spent on completing applications, writing essays, going on college visits, researching majors and campus life. Now that you’ve been accepted you’ll have more free time. While you continue to focus on academics, there is also time now to do fun (and enriching) things. By senior year you have most likely taken most required courses and there should be room in your schedule for elective classes. Elective classes are those that you take not to fulfill a requirement, but because they interest you. So much of our motivation to learn lies in intellectual curiosity, and it can thus behoove seniors to indulge this instinct. Taking courses because they are easy is a tactic that many students use, but this is not an effective way to avoid senioritis – your lack of effort in your easy classes may bleed into your challenging classes and threaten your grades. Signing up for courses that make you want to work hard may just increase your motivation in all of your studies. You can also use your extra time to pursue your passions or hobbies, join a club or organization that you are interested in, cultivate your relationships with friends and family (you’ll miss them when you leave for college), read a good book, and plan your summer. Second semester is a great time for all of these things. You’re about to be on your own and you’re going to have be fully independent. Second semester senior year is the time to figure out and practice things like how to have a balanced and healthy diet to sustain you through hours of tougher homework, how to deal with the extra free time that results from the less-structured college life, how to manage your money, how to do your laundry, and how to clean you room! Second semester junior year is a critical time to prepare for the college application process that will begin senior year. From test prep to summer plans, every detail matters. Every year of high school academic are important. Junior year is no exception but it is the last opportunity students have to prove consistently high marks OR a clear trajectory of growth. If you had a weaker start in high school but you have shown consistent growth through second semester junior year, college admissions committees will look at your grades favorably. Remember, any progress you make senior year won’t be on your application transcript. Colleges want to see a commitment to 2-3 extracurricular activities that you’re really passionate about. Being able to show a leadership positions that has made a difference in your school or community is the best way to prove you will an asset to the college of your choice and will be able to contribute to the school community. Begin thinking about possible leadership position in your senior year while you are still a junior. Put your name in for captain, start planning your student council campaign, talk to your coach or teacher about how you can contribute more to the team. A productive and fulfilling summer is just as important as the school year for your college application. Options can include work, volunteering, travel, or study. To have the best opportunities available, start planning for them before spring break of your junior year. Most summer programs have application processes that will need to be completed before March. Summer is a time when most students do not have the structure of a daily schedule. Summer before junior year is the best time to prepare for standardized college, or, if you have completed your junior year, it is the best time to conclude test prep so you can take official tests in the early fall. Meeting with a tutor more frequently during the summer months and adding more practice will help you reach your score goals. And don’t forget to check exam dates and make sure you register for the right ones. Start thinking about who will write your letters of recommendation. Before you leave for the summer, ask your teachers if they will write your recommendation. a) It is more courteous to ask for the recommendation (unless she has already agreed to write it, then begin your letter by confirming her offer). b) Include a list of your accomplishments from freshman year to present. Don’t forget to highlight any leadership positions and include non-school related activities. (This is an excellent motivation to write a resume). c) Be direct and ask for a strong, stellar, outstanding… whatever word you choose… recommendation. d) Provide a time line for a response and a date for the completed recommendation. e) Close your request with a thank you and. By the end of second semester junior year, you’ll want to have a preliminary list of colleges you want to apply to. Start the research. Know your “competitive tiers” – the schools that would be your target, reach, and safety schools. Use spring break to visit colleges while they’re in session. While it is nice to visit schools on your list, also take the schools with a variety of factors – urban vs. rural, big vs. small, public vs. private, etc. Information that includes a wide range of factors regarding schools and campuses will be helpful to inform your final choice. There’s a lot to keep track of in the college admissions process. Standardized test registration dates, early decision and regular decision application deadlines, dates to get your transcripts and your letters of recommendation – start adding these to your calendar NOW and review dates regularly during your senior year. Students should take both the SAT and the ACT. Not true. While the tests are more similar due to the recent changes to the SAT, it’s still important for students to focus studying specifically for one test. By dedicating effort toward one exam, students can become completely comfortable with that exam and the test–taking skills it requires. Plus, who wants to sit through hours and hours of test by taking each one multiple times. Everyone at my school takes the SAT so I should take the SAT. Student have a choice and they should choose the test that best reflects their academic strengths. Colleges prefer the SAT (or ACT). Not true! At our last check, all US colleges don’t care which test gets submitted, so students should take the test that suits them best and submit that test. Everything is riding on my scores. Standardized test scores are one factor that is considered when colleges are reviewing an applicant – but they are not the most important. According to the National Association of College Admissions Counselors, college admissions officers consistently rank grades and course rigor as the most important admissions factors. So a student can have great test scores, but if his or her grades and courses aren’t up to standard, he or she may have a considerably lower chance of getting in. In fact, it can be a red flag to admissions officers if a student’s grades and test scores are wildly unmatched. That’s not to say that standardized test scores aren’t important. A score that’s too low could be the deciding factor of admission to reject that student’s application. It’s important to do well on standardized test scores, but it’s not the only thing to focus on. I have great grades so I’ll do well on the SAT or ACT without studying. Ideally, by the time students are sitting for the SAT or ACT, they will have adequately covered the content and concepts being tested. However, curricula vary from school to school, and every student has different abilities. The truth is, for some students, there may be little overlap in what’s being taught in class and what’s on the test. For other students, some concepts may have been covered previously, but so much time has passed that they’ve forgotten some of the key elements. Much of the content students are tested on in the SAT or ACT is also presented in a different format, so even though they’ve covered the concepts before it may seem unfamiliar. There’s also the issue of time constraints, test-taking strategies, and other factors that don’t mimic traditional learning or the classroom experience. Just because a student performs well in class doesn’t mean he or she will do well on the ACT or SAT the first time around. A student wouldn’t go into any other test unprepared, and standardized college entrance exams are no different. The ACT is “easier” than the SAT. This common myth – pitting one test against the other and even asserting that colleges value one over the other – never holds true. All colleges and universities equally consider both tests. No test is “easier” than the other. The factor that students must consider when choosing which test to take and prepare for is which one is a better fit for his or her abilities. At Sentia Education, we recommend students take a diagnostic test doe the SAT and the ACT under timed conditions to get an idea of which test they perform better on, which test they prefer and what aspects they need to prepare for. I don’t need to take the SAT or ACT until the spring of my junior year. While this is the most popular time for high school students to take college entrance exams, it leaves students with little time for improvement should they not perform as they expected. Also, with finals, AP exams, extracurricular activities and challenging courses, spring of junior year can leave students stretched thin – which can hurt test prep and performance. The truth is, many students will have covered the most frequently tested concepts on the SAT and ACT by sophomore year of high school, so for some students it can be better to take the test a little earlier if they’re ready. Through test prep sophomore year and earlier in junior year, students can get a refresher on the content they’ve already covered – allowing them to take the test earlier and have more time for adjustments. Also, they can learn test-taking strategies and tips that don’t necessarily require prior knowledge of the content. You can’t really improve your Reading score. You CAN improve your Reading score by expanding your vocabulary, honing your critical reading skills, understanding the author’s point of view, and mastering your test-taking skills. So read – books, newspapers and anything else you can get your hands on. Sentia Education offers expertise on additional skill-building tools. The science section of the ACT measures a student’s ability to read charts and graphs and interpret data. There is little need for actual science knowledge to do well on science section of the ACT. Being strong in science may not translate to the ACT science section. You should take the SAT or ACT as often as you can. At Sentia Education, we recommend students take the SAT only a couple of times. In place of official tests, we offer a numerous practice tests that help students and tutors identify continued challenges as well as gauge test readiness. Don’t treat the official SAT or ACT as practice. Practice tests are for practice. The real thing is the real thing. Since the essay is optional, you don’t need to take it. We encourage students to take the ACT with Writing and include the SAT essay in their registration. Before making your decision, you should check the requirements of the colleges you are applying to. Many colleges either require or recommend that applicants include the essay and, if that’s the case, you definitely want to take essay portion of the test. Even if you are not quite sure which colleges you may be applying to, it’s best to include the essay in case it is required or recommended by any of the schools you do end up applying to, especially since you cannot take the Writing section test by itself. 37 colleges accept SAT subject tests. 44 colleges require SAT subject tests. 26 colleges recommend SAT subject tests. Of these, 23 do not let the ACT replace subject tests. 37 colleges accept SAT subject tests. Of these, 36 do not let the ACT replace subject tests. Studies collected by FairTest show that good test prep programs can raise a student’s scores by 100 points, and in many cased, even more. Sentia Education works with each student individually to identify strengths and weaknesses in both concepts and skills as well as in strategies. A targeted approach to test preparation utilizes a student’s existing skills and helps them translate them to the standardized test format. Most of what students encounter on the ACT and SAT reflects specific math, reading, and writing skills they have already learned in school. General academic performance will, in many cases, predict performance on standardized tests. Students who have worked hard and earned A’s are in great shape to do well on the ACT or SAT. The key to success on standardized tests is to work hard in school, and then do enough focused test prep to become completely comfortable and confident with the content and question types encountered on the ACT or SAT. There are a variety of test-taking strategies which can boost your student’s score. The misconception comes from the fact that — in addition to explicitly testing math, reading comprehension, verbal reasoning, and writing skills — both the ACT and SAT take basic or foundational concepts and ask test-takers to apply them in ways that can seem tricky. The tests also try to measure critical thinking and problem solving ability, abstract skills that are built into all high school subjects rather than taught in a particular class. This is a method of reading a textbook so that the information you read really does enter your long term memory. It is based on work by Thomas and H. A. Robinson, Spache and Berg and R. P .Robinson. Its sometimes cryptically known as SQ3R. The method has been shown to improve a readers understanding, and his/her ability to recall information. In other words, the reader is more likely to learn, and to learn more, of the material he/she is reading. If you use this method, reading won’t be a waste of your time. 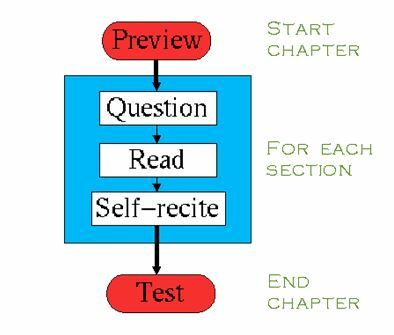 In this method you follow five steps – Preview, Question, Read, Self-recite and Test (PQRST). 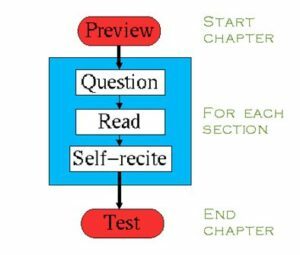 The middle three steps apply to every section within a chapter whilst the first and last steps apply to the chapter itself. You may find that many textbooks are compiled in a way which makes this method easy to apply, using an introductory passage, and questions at the end. QUESTION As you read through each section, start by asking yourself “what am I supposed to learn in this section”. This helps to get your brain in to sync with the topic being discussed. READ. Next, actually read that section. Do it carefully, think about the meaning and relate this to other things you know about this and similar topics. Do some underlining or highlighting of key words. Don’t overdo it! If you want to take notes, read the whole section first, and then summarize it later. SELF-RECITATION requires that you try to remember the main points of each section and that you say them out loud (if possible) to yourself. Check back against the text, and note the things you missed out. Ensure that you didn’t miss them because you haven’t learnt them. Only then go on to the next section and Question again. TEST yourself after you have finished the entire chapter. How many of the main ideas from the chapter can you remember? Think about the relevance of what you learnt and how it all fits together. Reread any chapter summaries. Even though you have only just read the chapter, now is the best time to test yourself. Can’t concentrate for more than 15-20 minutes? Manage to make average grades from what you retain in class and with the little studying you manage to do? Know your purpose. Scan the content to identify the most important concepts you need to know to achieve the top grade. Make a list of items to memorize. Quantify – only by being objective will you increase your productivity. Limit studying time. Study for specific periods of time or to learn and master a specific concepts or problem set. Either way, be sure you study for 100% of the time you commit to – no smartphones, no internet, no TV, no distractions. Multiple Sources. Sometimes its not enough to know ‘just enough’. You might not completely understand a topic/concept or you may understand some of it but not enough. To solve this dilemma, read/view/talk to multiple sources. Remember: one author may explain something better than another. Its vital to refer to different sources to strengthen your understanding. Select the best sources. If there are high-yield versions of textbooks, pre-made notes optimized for retention, mnemonics collections, essential problem sets (and solutions), use them. Feynman technique. This Mental Model, named after Richard Feynman, a Nobel Prize Winning Physicist, designed as a technique assist with learning new concepts as if you were explaining them to a complete beginner. His technique includes drawing diagrams, schematics and notes on a blank sheet of paper. Cultivate daily habits. The best approach to successful studying is to train daily for a relatively short amount of time. 30 min of difficult math problems every day is much more effective than 3 weekly sessions of 2 hours each. If you’re going to take notes, do it right. Note taking is associated with better retention rates than just reading or reviewing pre-existing notes. Don’t cram for tests. If you are going to do well in a test then you need to be relaxed. In the days before a test you should do nothing more stressful than a couple of hours gently reviewing your notes to assure yourself you know your stuff. Make a study guide. As the student puts together a study guide, he also is putting small chunks of information systematically into his brain. An auditory or kinesthetic learner can talk out loud as he creates his study guide. Put together a study group. For older students, it is a good idea to study the information with others. It gives students the opportunity to make sure each student understands the material and has studied in a comprehensive manner. Students can quiz each other on information and create outlines for possible essay questions. Practice and test yourself. The best way to learn is to use the knowledge you are trying to acquire. You’ll figure out your weak spots in your understanding of complex concepts. There are resources online to test any kind of subject. Planning can reduce stress and anxiety. Set your goals, plan your studying techniques and stick to the plan. Cultivate the right mindset. Essential qualities of all productive students include: Diligence, Discipline, Direction and Durability. Do exactly what you have to do daily, no matter what. Think positively! Try to imagine yourself getting an A+ on the exam. Imagine getting questions you know the answers to, expressing yourself clearly and concisely, and feeling good about yourself and your performance. Think about how good you will feel inside when the test is over and all your preparation has paid off. SAT Subject Tests—AKA SAT IIs—are slightly cuter versions of the SAT. Each Subject Test (there are over 20!) is one hour long and corresponds to material taught in high school-level academic courses. If you’re thinking about taking an SAT Subject Test, read on to find out everything you need to know! 1.) Who should take SAT Subject Tests? You should take SAT Subject Tests if the schools you’re applying to require, recommend, or officially consider them. If you’re not sure where your top choice colleges stand, here is a comprehensive list of all schools that use SAT Subject Tests for admissions decisions. Keep in mind that colleges vary in the amount of emphasis they place on SAT Subject Tests. Schools that “require” SAT Subject Tests, for example, will not even review an application that comes without them. Other schools, like Stanford and the University of Virginia, do not officially require Subject Tests, but applicants who don’t submit them will be at a sharp disadvantage. If you are applying to any school that “recommends” SAT IIs, you should absolutely take them unless your scores will mar your application. Still more schools neither require nor recommend SAT IIs, but will consider them if submitted. Such schools treat Subject Tests as supplementary information and use them to form a more complete image of a student. Some schools, like the University of Notre Dame, only consider Subject Tests that enhance an application. Contact admissions representatives at your top-choice schools to find out where they stand. 2.) What Subject Tests can I take? 3.) Are Subject Tests harder than the SAT? What about AP exams? The SAT Reasoning Test and SAT Subject Tests assess entirely different things. Neither is harder than the other. SAT Subject Tests are designed to measure how much a student knows about a subject. By contrast, the SAT presents basic content in new ways in order to evaluate students’ reasoning skills. In other words, the SAT tests your ability to figure out the best approach to a puzzling question about an elementary topic. AP exams are much harder than SAT Subject Tests because they test college-level knowledge, whereas SAT IIs measure principles taught in high school-level classes. 4.) When should students take SAT Subject Tests? In general, students should take Subject Tests immediately after completing coursework in the subject they wish to test in. For many students, this means testing at the end of freshman or sophomore year! Language and Literature Subject Tests should be taken either during the spring of junior year or fall of senior year, as multiple years of coursework in these subjects will benefit exam performance. If you are taking and doing well in an AP course, you should take the same subject’s SAT II as close as possible to the actual AP exam. Keep in mind that not all Subject Tests are offered for every test date! Language Subject Tests with Listening, for example, are only offered during the November administration. Make sure to review the Subject Test calendar so you don’t miss your opportunity to test! 5.) Which Subject Tests should I take? Students should take Subject Tests that reflect their academic strengths and interests. It is also a good idea to test in subjects related to one’s prospective major. An applicant to a prestigious nursing school who submits Biology and Chemistry scores would certainly look better than one who submits SAT IIs in Literature and French! Also, keep in mind that some programs and university departments require specific Subject Tests. 6.) How can I get out of taking SAT Subject Tests? Believe it or not, several schools will waive their Subject Test requirement if a student has taken the ACT with Writing. This is because such schools see the ACT Science and Writing sections as comparable to SAT Subject Tests. Beware, however, of this foggy path! Most students accepted to the institutions mentioned above do submit SAT Subject Tests. Furthermore, many colleges (including Harvard, Princeton and Columbia) require Subject Tests in addition to the ACT. Also, most colleges that “recommend” or “consider” subject tests want to see them—even if an applicant has taken the ACT. 7.) How should I prepare for SAT Subject Tests? Sentia Education offers top of the line tutoring for all Subject Tests, but if you’d rather self-study, the following resources will help you get started. SparkNotes: SAT Subject Tests – Provides free online review material and practice tests for the Biology, Chemistry, U.S. History, Math Level 1, Math Level 2, and Physics exams. Practice Questions from the College Board – Here you will find a bank of practice questions for all 20 Subject Tests. The SAT and ACT are the main college admission tests and students often forget about SAT Subject Tests. Many students don’t realize the benefits of taking a Subject Test because a number of colleges and universities in the U.S. only require students to submit an ACT or SAT score. However, there are several surprising reasons why you should consider preparing for a Subject Test. The list is longer than you might think. Each school has its own policy surrounding Subject Tests. For the schools on your list, visit each school’s website or contact the school directly to see if they require, recommend, or consider Subject Tests for a student’s application. Be sure to check specific majors or programs at your target schools – the entire college may not require a Subject Test, but the engineering program or science programs might. What does it mean if a school recommends a Subject Test score? For selective schools with low acceptance rates, at least two Subject Tests are “strongly recommended.” Your application will still be considered without submitting Subject Test scores, but you will be much more competitive with Subject Test scores to submit. Arre you willing to take that extra step to stand out from the rest of the crowd. Do you know your academic strengths and have enough confidence to submit an objective number measuring those strengths? Some schools allow students to bypass introductory courses if their Subject Test scores are impressive. This means you can fulfill required credits more quickly. Subject Tests are different from the other elements of your application: they serve as bonus points and give admissions officers a clearer sense of what type of student you are, therefore making it easier to determine if you’re a good fit for the school. If you know you’re proficient in chemistry, a solid Subject Test score in addition to a strong academic transcript could be indispensable information on your application. This also adds a substantial amount of credibility to your claim that chemistry is your strongest subject. Hello, and welcome back from winter break! With your short reprieve from reality now over, we thought now would be the perfect time to remind you of your future realities: college! Your school year is now about halfway over (yes, the technical midpoint of your school year is a month or so away, but winter break certainly seems like a midpoint), and that means you still have a lot of work to do. In addition to the mandatory schoolwork, you also have the odious tasks of college admissions to think about. So, with that in mind, here are our suggestions for what you should be working on for those frigid and gelid winter evenings! For the most part, your hard work should already be done. You’ve already applied to most of your colleges, right? If you have any applications left, complete them now. Literally. Right. Now. Do not delay anymore, as deadlines are final! After your applications are in, wait patiently. Plan a reward for yourself for when those acceptance letters start to roll in. And don’t beat yourself up if you don’t get into your first-choice schools. That’s why you didn’t just apply to one school. In general, relax! That being said, don’t slack in school. Keep up your hard work for a few more months, and make sure colleges don’t reconsider their decisions to admit you. You have the most on your plates this spring. Make sure you registered for winter or spring SAT and ACT administrations. Find out how many SAT Subject Tests you need to take for the schools you’ve been looking at, and register for those. Next, study, study, study for the tests. Consult this blog for SAT and ACT practice questions, and don’t hesitate to ask for help from one of our talented and charismatic tutors. Additionally, you should plan on visiting colleges in the spring and summer. Find out what schools are the best fits for you, and ask counselors at the schools what they need from you for your application. Try to narrow your list of schools down to a top 20 or 25. Sentia also provides college-consulting services, and our talented admissions experts would be more than happy to help you in your search. You should begin thinking of registering for standardized tests. You’ll need to take them at some point over the next two years, so you may as well get them out of the way earlier than the rest of your peers do. Take a practice ACT and SAT, and see which test is a better fit for you. Regardless of which test you take, start improving your vocabulary now. Vocabulary is a major part of the SAT, but it can’t hurt you on the ACT to have an extensive vocabulary either. There really is no such thing as knowing too many words. And it is easier (and better) to learn vocabulary words slowly over several years, rather than cramming them into your brain a month before you sit for any tests. Read books and magazines at your difficulty level or even above your difficulty level, and improve your critical reading skills alongside your vocabulary. You should also start looking at colleges and considering your options. Do you want to go to a big school or a small school? Close to home or far from home? In a city or in the middle of nowhere? Get at least a general idea of what kind of school you want to attend. Trust us. It’ll save you hours of time in the future. Finally, keep your grades up. Having consistently high grades will make you a more attractive applicant to colleges, and now is also a great time to instill important study skills for your future academic career. If you need help with your grades, don’t hesitate to ask Sentia for help there too. Most of us can learn anything we put our minds to. However, we have a preferred way of learning. Get to know your learning style and study in the ways you learn best. Everyone has a mix of learning styles. Some people may find that they have a dominant style of learning while others may find that they use different styles in different circumstances. There is no right mix. Nor are your styles fixed. Research shows us that each learning style uses different parts of the brain. By involving more of the brain during learning, we remember more of what we learn. Use graphics to reinforce learning­­, films, slides, illustrations, and diagrams. Color coding to organize notes and possessions. Use flow charts and diagrams for note taking. Visualizing spelling of words of facts to be memorized. Use tapes for reading and for class and lecture notes. Learn by interviewing or by participating in discussions. Have test questions or directions read aloud or put on tape. Experimental learning (making models, doing lab work, and role playing). Take frequent breaks in study periods. Trace letters and words to learn spelling and remember facts. Use computer to reinforce learning through sense of touch. Memorize or drill while walking or exercising. The Oxford English Dictionary defines stress as “a state of mental or emotional strain or tension resulting from adverse or demanding circumstances”. Any one preparing for the standardized college admissions test knows that this definition is a perfect description of the feelings and emotions created by these tests. But did you know that stress that is managed could actually be a good thing? A 1979 London research study recognized that stress could be beneficial. Yes, you read that correctly – beneficial! The benefits of stress can be found in two main ways; First, stress can actually enhance performance and, secondly, stress from challenges, not threats, invite physiological responses that improves thinking by making the heart beat faster, adrenaline surge, the brain sharper and the body release a different mix of stress hormones which aid in learning. You can rethink stress by understanding that it is a normal response when we care about what’s at stake. Since stress is unavoidable, working out how to harness it may be wiser than trying to eliminate it. Embarking on a mindful approach to the test prep process might sound hokey, or perhaps like a way of complicating a process that is pretty straightforward: study the material, take practice tests, get results. But being mindful is a practical and subtle way of managing stress – AND it puts YOU in control. Become aware of your thoughts. There’s a little voice in your head that’s talking to you constantly. What is it saying? How do the thoughts make you feel? Take a breath. When you become aware of a thought (any thought, positive or negative) take a breath. Let your thoughts come and go without analyzing them. Be aware of what happens to the feelings caused by stress? Let your breath serve as a cue for you to be fully present in this moment. On the next exhalation imagine any tension in your body flowing out through the soles of your feet into the air. Let your tension go on the exhalation and on the inhalation breathe in relaxation. Guided Imagery. Guided imagery is a relaxation technique that utilizes the power of the imagination and all of the senses – what we feel, see, hear, taste, and smell – to create a relaxing scene. Guided imagery can be used to visualize positive outcomes, especially in stressful situations. For instance, if a student is anxious about an upcoming test, she imagines going through it in a calm and relaxed manner beforehand. This is called a mental rehearsal. What if I’m good enough? What if I’m smart enough? What if I have what it takes? to these objective facts is up to you. When you feel stressed out, anxious, or scared, tell yourself “I am willing to see this situation differently.” Keep an open mind, and stay willing to be positive and relaxed. Test prep is a process, but when you bring your whole self to the experience, amazing things can happen.